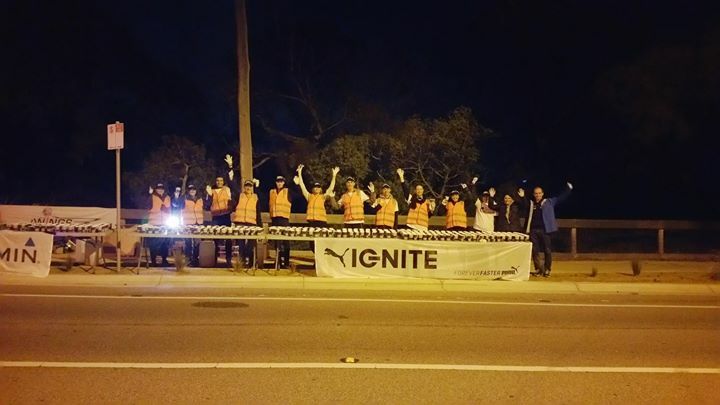 Human Performance Development helped out Knox Athletics Club staff the 15 / 40 K drink+fuel station of the Melbourne running of the 2015 Wings For Life World Run, on Beach Road, Beaumaris. Wings for Life is an international not-for-profit spinal cord research foundation who’s mission is to find a cure for spinal cord injury. They fund world-class scientific research and clinical trials around the globe aimed at healing the injured spinal cord. A long night for us, it was an even longer one for the top runner in Australia, Michael Wardian (USA) who managed an incredible 70.66Km before he was finally caught by the chase car. Michael placed 11th in the world, with the world’s top performance of 79.90Km coming from Austrian Lemawork Ketema in Niederösterreich (Austria).